Ok, the next flavor isn't new, but it does feature Edy's whimsical new packaging style, does that count? 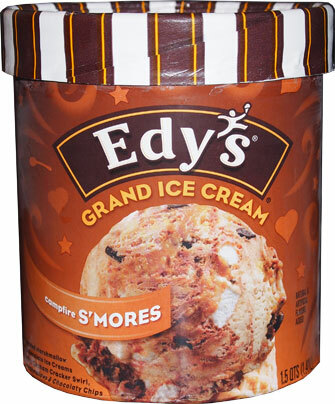 Hehehe, but seriously, it's been 4 years since I tried Edy's S'mores light ice cream, and people kind of mention this flavor every now and then, so this summer seemed like a good time to catch up with the grand version. 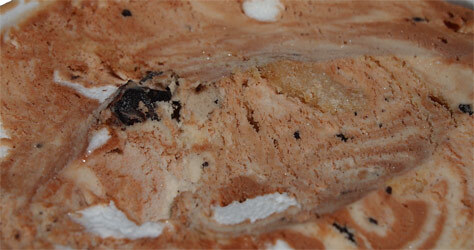 Alright, Edy's / Dreyer's campfire S'MORES Grand Ice Cream. 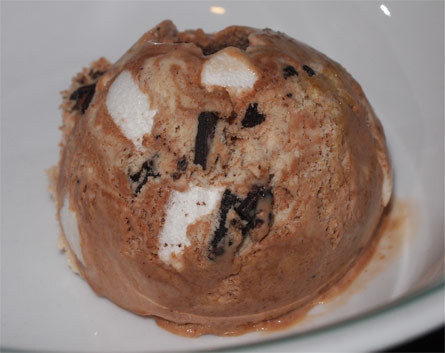 It's toasted marshmallow and chocolate ice creams with graham cracker swirl, marshmallows & chocolaty chips. Cool, just cool. What a great looking ice cream. What, you don't see it? Now do you see it? Talk about one impressive first scoop of ice cream. I see marshmallow, big chunks of chocolate, and even some graham on the right side there. It's just one of those ice cream that you start tasting long before it hits your taste buds. One more shot because this is just an awesome looking ice cream. It's the kind of ice cream you're afraid to eat because it looks too tasty. You start wondering if there's any way it can possibly taste as good as you hope. Will that massive chunk of graham be a wonderful mountain of sugary graham-tastic-ness? Will the chocolate be plentiful and strong enough? Will it all be perfectly balanced? Yeah, I'm messing with you aren't I? Sorry. It's a neat flavor, but I don't love it. If you really dig Edy's marshmallows, you should love this flavor. 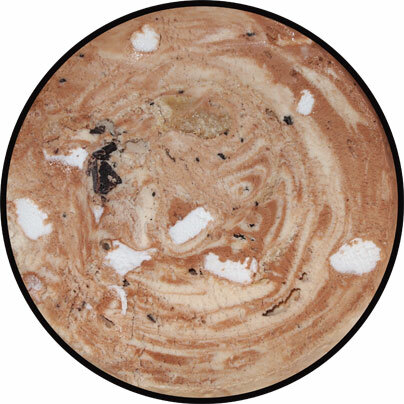 See, the toasted marshmallow ice cream reminds me very much of their marshmallows, which I just never got in to. There's just something about the toasted marshmallow base that isn't working for me, an artificial air to it. I forget my wife's word but basically she was commenting on how it's a bit off. It's still cool, I'm sure it's popular, but I'm just not digging that funky marshmallow taste. On Second Scoop: I couldn't help myself, the second scoop became this sunday sundae. The more I thought about this ice cream, the more I wished it had more crunch, whether it's more graham or more of those great looking chocolate chips. There's just not enough of either of them. Had this one been chuck full of chocolate chips to offset the marshmallow flavor, it would have been a hit for me. So, I made my own fun... and why yes, that is one of those new brownie chewy chips ahoy on top. Overall, I'm really glad with how Edy's has stepped up their post FDD game. 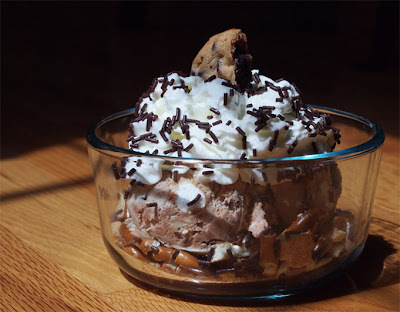 Dubba, I did also spy pretzels in your sundae - nice one! How are those new brownie chips ahoy cookies? the cookies are ok, not really what I dreamed of.... pretty good in a sundae though! Thanks Dubba! I think the cookies would help some boring vanilla I've got in my freezer. Just listened to the latest episode of the Nosh and enjoyed it. I too am very jealous of the Turkey Hill visit! I tried the slow churned version last summer when it was still a limited edition flavor and I absolutely loved it. When I saw the Grand version at Walmart last month, I immediately grabbed a carton hoping it would taste just as good, if not better, than the "healthier" kind. Pfftt totally disappointed. For some reason, it just didn't taste as satisfying. I'm still keeping an eye out for the slow churned version. not sure on the slow churn availability. it's not listed on the website but I thought I saw it at one of my local stores. Wow, I couldn't disagree more with most of your review. Graham cracker swirl... let's ponder that for a minute. I frankly find it to be one of the most creative and tasty flavor swirls that I've ever tried. I do agree that it could use more of the graham cracker swirl. 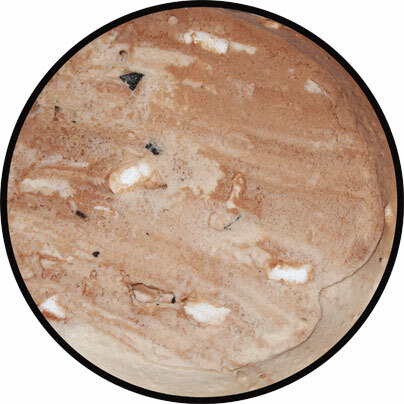 As for the looks, frankly I couldn't care less, but that first cross-section photo looks a little like some kind of delicious planet to me! well, it's not like I bashed the flavor, it just didnt win me over. Graham cracker swirls are very cool, but I've had better.